« Vegetarians fare well in Lima, Peru. I’ll be living on the coast of Peru for the next month, volunteering at Otra Cosa, a vegetarian restaurant (and international volunteer agency). All of the tips of the restaurant go to different charities within the community. 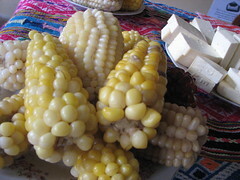 I’m currently learning the menu, which is a mix of Peruvian and Meditteranean foods. With all the cooking at work and at home, I’m experimenting with a lot of foods I haven’t worked with before. I don’t necessarily know how to use everything the correct way, so feel free to share your recipes or information with me. Here are a few of the first unique foods I have discovered. 1. In a bowl, toss corn and olive oil, spread on a sheet pan and roast slowly in a 300 degree oven for 15-20 minutes, until golden brown and cooked in the middle. 2. Will look similar to a half cooked popcorn kernel once it is done. Remove from oven, pour back into bowl and toss with salt to taste. 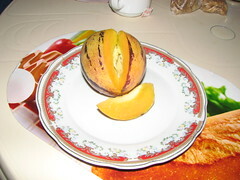 I bought this from a mobile roadside fruit and veggie vendor. It looks like a shriveled cucumber and when it is cut into, there’s a bunch of large black seeds (pipas) that look like pieces of plastic. I hollowed out the middle and cut the skin (it’s a little thinner than a bell pepper) into strips and ate it with my salad. It tastes just like cucumbers, without the water content or the seeds. I wasn’t sure what to expect with this fruit. It’s the shape of a giant tomato but it’s yellow with purple stripes. I thought it would have a big pit in the middle like a mango, but to my surprise it was hollow inside and had a thin membrane in the middle. It tastes just like cantaloupe. The inside has the same color, texture and taste like a cantaloupe. The vendor told me I could eat the skin, but I cut it off anyways. I’m sure it would have been fine. The skin was like a tomato peel. My Sra. Tells me it’s called pepino, but that’s the same word for cucumber. I will do some further research and update the name when I can. I bought núñez at the market, thinking they were just like kidney beans. They are about the same size and density, but much prettier. I took home my núñez and treated them just like any other bean (soak overnight, boil until tender). I mixed them with some rice, oregano and tomatoes and had a very satisfying evening of rice and beans. A few days later I was talking to Nella, the chef I work with at Otra Cosa, about the beans. 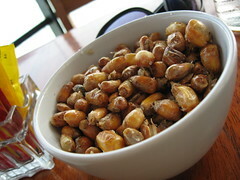 I asked her how she prepares them and she told me to take the dry bean and deep-fry it until it is like cancha. I told her how I cooked them and she laughed at me. I asked her if she knew anyone who had cooked núñez like a bean and she told me never. I may be the first person in Peru to boil núñez. I’ll have to try it fried, but boiled it’s a creamy bean that retains its speckles. And last, but not least for this post, Mazamorada! It’s a street snack that set me back sl. 50 (about 15 cents US) and it’s rice with condensed milk and a syrup of apples, pineapples and the tiniest peach in the world (about the size of a large grape, complete with pit). I thought it was too sweet but tasted just like it was supposed to. It’s a good snack, but not really much of a meal. 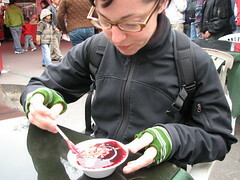 a mistake…..the correct name of this dessert is, MAZAMORRA MORADA(the purple corn with fruits) and the other is Arroz con leche (rice with condensed milk), but if you combine the two desserts that´s called COMBINADO (COMBINATION,MIXED, i´m not sure the real term in english. Thanks Elizabeth for the update. There were no signs and I was only verbally told the name of the dessert, which sounded like Mazamorada to my gringa ears. A vegetarian restaurant that is also a volunteer agency, that’s interesting. It is always nice to see local businesses that promote a cause. I hope you have a great experience while you are in Peru. I can’t say I have ever had Peruvian food but it does sound yummy.